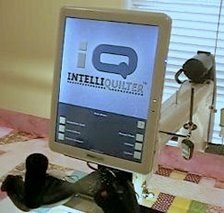 IntelliQuilter Training Videos: Drift Test. At the main menu, touch 'design/sew quilt' then 'edit/sew existing'. Touch the catalog named 'TEST' and touch ' drift test'. It's the one where you can see multiple rows of the heart leaf pattern. Do not choose the one that is really dense, that looks just black. This test is a 10" square. Touch the small green square where there is an S and E at the top left. It's not right at the corner. Move your machine to where you want the S and E to be on your quilt. Now touch 'Sew Quilt' and then touch the image of the pattern. Your machine will move to the start of this pattern. Place a piece of masking tape carefully under the needle. Drop the needle to make a hole in the tape. Do not move the machine when you do this. The Details setting should be 1.4. Touch start and the machine will begin to move. It will not stitch because it is in preview. the motors are aligned correctly. It will run for just over 8 minutes. When it finishes the needle should be right over the original hole in the tape. check that the motors are perfectly straight. Do not touch the table or machine whilst the test is running. you can download it from this link, at the Yahoo iQ group.